Weighty Matters: Need Some Kids' Health Good News And Inspiration? You've Got To See This! Need Some Kids' Health Good News And Inspiration? You've Got To See This! Today's guest post comes from Middlesex County RD Nadine Devin. I had the great pleasure of meeting Nadine in person last week when Dr. Dan Flanders and I flew down to chat with her community about childhood obesity. What's incredibly powerful about small communities is that unlike big cities, they're nimble. Nadine has been instrumental in helping to guide her community into changing their children's food environment, and wonderfully, she's getting broad buy-in. And do yourself a favour, watch the embedded video too. This is what change can and should look like. Huge kudos to Nadine and to Middlesex County! As a mother and an advocate for child health, it concerns me that the favoured team sideline snack is a salty or sugary treat like candy, chips, cookies, Freezies and juice boxes, and that gone are the days of serving orange slices and watermelon after a game. We all sign our kids up for sports to keep them active and healthy but these snacks are not in line with that mission. The average child is consuming at least three times more daily sugar then recommended. At the same time, 60% of children are not consuming the recommended amount of vegetables and fruit. When these two situations combine, the danger is their increased risk of heart disease, cancer, diabetes, weight gain and dental cavities. But there is good news! Evidence shows that health outcomes in children improve when communities work collaboratively to support the healthy choice. Small changes in our food environment can illustrate to our children that water, vegetables and fresh fruit are vital and enjoyable and that treat foods have a time and a place. Change doesn’t happen by itself. It happens when one person makes one decision to lead the change and illustrate how others can follow suit. 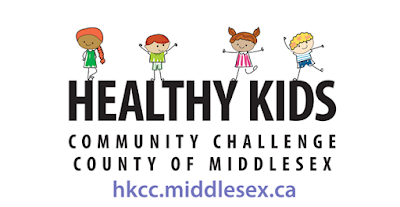 I have the pleasure of managing a provincial grant for the County of Middlesex as part of the Healthy Kids Community Challenge, a Province of Ontario initiative designed to improve the health of children 12 years and under. 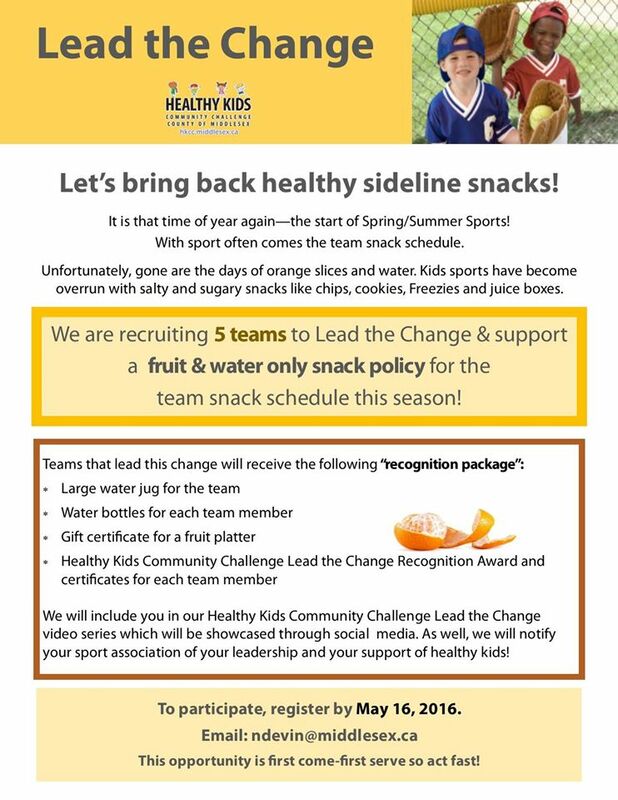 In May 2016, I put a challenge to local soccer and baseball coaches to "bring back healthy sideline snacks". The challenge was simple - when it is a parent's turn to supply snacks for the team, they are asked to bring only water, vegetables and fresh fruit. Those who challenge social norms can face harsh criticism, so I wanted to make the change easier for coaches. For their leadership, players and coaches would be awarded with a recognition package including stainless steel water bottles for each team member, insulated water jugs, certificates, a team plaque and public recognition. I hoped for five teams, and was thrilled to have sixteen sign up for the challenge! The feedback has been overwhelmingly positive. To see for yourself, check out the following video of star players and coaches. 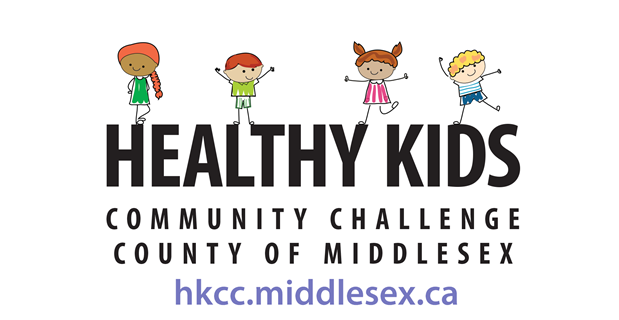 To build on this call to action, the County of Middlesex recently launched our Lead the Change Healthy Kids Community Challenge Recognition Awards. The mission? To inspire agencies across the County to adopt changes in their organizational practices that limit the provision and marketing of sugary drinks and snacks, and model the wonders of water, vegetables and fresh fruit. Successfully awarded sites will receive public recognition for their efforts. We hope that this acknowledgment by peers and the community will reinforce the acceptability of these ‘new norms’ and empower momentum in agencies across the County. One change at a time, we can build a food environment that supports our current and future generations in being the healthiest they can be. 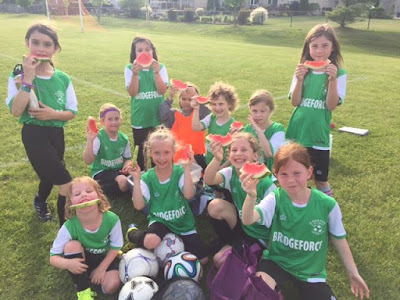 To inspire local action, we interviewed six County of Middlesex champions who have led the change in their respective agencies by modeling and supporting the healthy choice. These stories illustrate that change can happen, it will be accepted, and you too can make a difference in your community. 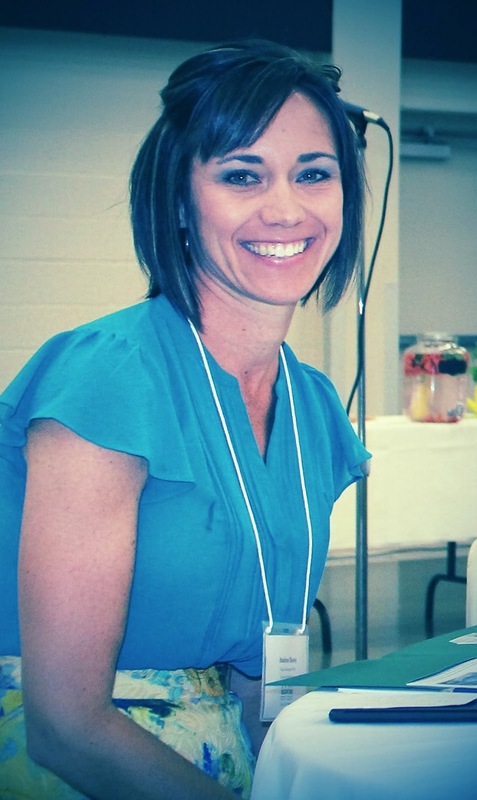 Nadine Devin, RD MHSc., is the Project Manager for the County of Middlesex Healthy Kids Community Challenge. For more information on the Challenge you can visit online, or follow on Facebook or on Twitter. You can read more on the history of the Healthy Kids Strategy here.